As the last heiress of the House of North, Alissa knows that striking up a secret friendship with a half-vampire enforcer is dangerous, but Merrick is a temptation she can't resist. But when Alissa is kidnapped, Merrick proves that he will do anything to protect the woman who tempts him with her very existence. What happens when two people who are never supposed to meet are instantly attracted to each other? 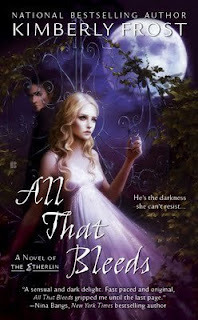 Alissa is a muse and Merrick is part vampire; by all accounts, the two should not be attracted to each other. What do you do when you're not supposed to see the other person? Find ways around it, of course! Alissa begins writing Merrick secret letters while he sends her thoughtful gifts and they continue with their secret correspondence. This idyllic world can't last forever. Alissa is kidnapped and thrown into Merrick's world, forcing them to make decisions about their illicit relationship and their futures. As a character, Alissa is brave, intelligent, compassionate, and unique. The reader will take an instant liking to her. Merrick is handsome, charismatic, and mature. Merrick and Alissa complement each other perfectly. The reader will believe in their relationship, Merrick will go to great lengths to keep Alissa safe and Alissa risks her current lifestyle to continue a relationship with him. The secondary character vary from amusing to captivating to evil, the reader will find a good variety in this book. The plot was very different. The reader is introduced to the Etherlin and the world of the Muses. The Muses live in a bit of a bubble though, what happens when one wanders beyond the wall? The reader will enjoy Frost's smooth style of writing, the dialogue between the characters is snappy and will keep the readers' attention. This book is highly recommended to young adult/teen readers.